What is Clean beauty, and what brands should you buy? Everyone is across 'natural' beauty, 'green and eco beauty, but clean beauty is not just about choosing natural products. It's a new beauty movement that even mainstream cosmetic brands are embracing. Editor Trudi Brewer shares the latest game changer for the beauty industry? Clean means no known toxins in the cosmetic formula. Beauty companies need to be transparent, meaning every ingredient, including the fragrance, must be listed on the packaging so you, the consumer can choose. Today there is more transparency about what's in our cosmetics - and with the recent announcement that retail giants, US brands Target, Walmart, and Whole Foods are making initiatives to push for safer cosmetics, the personal care industry is really cleaning up its act. Essano Coconut Oil Lightly Moisturising Body Wash, $10. Consider what you wash down the drain, the products that you use to cleanse your body such as body wash shampoo, scrubs and toothpaste, are often the most toxic. Not only for your skin but, they end up in our oceans, polluting our sea and killing our wildlife. Whats the difference between natural and organic beauty? Natural refers to the ingredients derived from nature, but this does not mean organic. To call a product natural you only need five per cent naturally derived ingredients. Organic refers to natural ingredients that are grown without the use of harmful chemicals. The best way to ensure you are buying organic, is to look for the Natrue certification logo, or a certified organic logo, such as BioGro. This ensures up to 98 per cent of the ingredients in that product are derived from nature. Drunk Elephant C-Tango Multivitamin Eye Cream, $102. They can be. Remember plant extracts are the base to most medicines. Today's technology allows chemists to extract the very best from Mother Nature so good ingredients can be harnessed in cosmetics. But you also need to be realistic, beauty products can only do so much. Our skin is dynamic and changes with our lifestyle, and hormones and also reflects what's going on in our body. Consider eating a balanced diet of rich in organic whole foods, good fats, and plenty of water. This lifestyle change will reflect instantly on your skin. What chemicals should we be avoiding? When most people react to a product it's often due to the addition of synthetic fragrances. There are about 7,000 different chemicals used in cosmetic manufacturing, and while not all of them are bad, there are a few you do need to avoid. Parabens and phthalates are outdated toxic preservatives. Today there are natural alternatives such as coconut and rosemary oils. Propylene Glycol, is used to stabilize formulations. DEA, found in toothpaste and cleansers is added to give products a creamy consistency again coconut oil does the same job. Sodium Laural Sulphates, which are added to cosmetics to make them lather such as shampoo body wash, toothpaste, and foaming cleanser are no longer needed. While these ingredients are not good for us, these toxins also wash down the drain into our oceans, ultimately killing our sea life. What are my favourite natural beauty brands? Josie Maran Cosmetics Argan Enlightenment Illuminser, $41. Some of my favourite 'clean beauty' products. Burt's Bees Exfoliating Facial Towelettes, $13. Jane Iredale Lemongrass Love Hydration Spray, $56. Essano Rosehip Moisture Restorative Night Cream, $20. 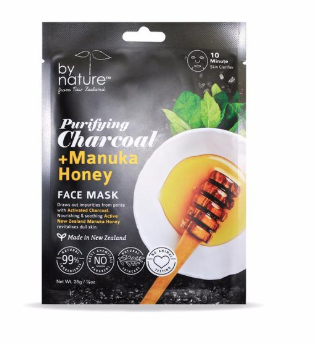 By Nature Purifying Charcoal + Manuka Honey Sheet Mask, $4.